Sabaidee 2010! I am Eliza Mott from Grosse Pointe, Michigan and my PiA fellowship is with the Luang Prabang Film Festival in Luang Prabang, Laos. I graduated from Princeton this past May, where I majored in Art and Archaeology and got a certificate in Creative Writing (Poetry). Outside of class, I was a devoted acolyte of the Nassau Weekly and later its editor-in-chief, the leader of a consent activism group called SpeakOut, and the undergraduate president of Ivy. However, my proudest accomplishment of the four years I spent at Old Nassau was hoodwinking Princeton into giving me a job as their official Instagrammer for my whole sophomore year. I have been in Luang Prabang for about a month and I don't think I could be any luckier--it's Never Never Land! Not only is LPB filled with butterflies, incredible architecture, chic textiles, delicious fruit, and stunning mountain and river views, but my job is fascinating and filled with purpose. The Luang Prabang Film Festival (LPFF) is the only major film festival that screens films only from Southeast Asia--a region in which filmmaking is a nascent industry. The festival, which my boss started from the ground up 7 years ago, occurs over the course of one week every December and features over 30 films. (This year, the festival will take place December 2 - 7, and I would be thrilled to see any tigers there! More info at lpfilmfest.org.) 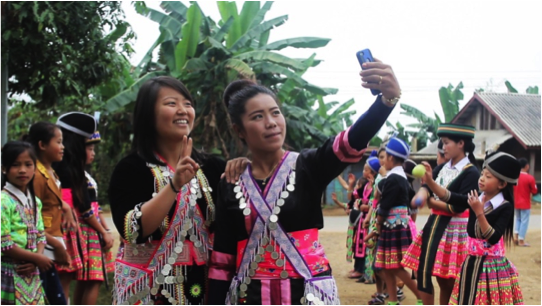 However, all year round, LPFF serves as a resource for Lao people, providing educational programs for those who want to learn about films and how to make them. Support for creativity and the arts in Laos is quite low, and LPFF provides some of that much needed support. Thank you for supporting PiA and the festival, and for helping to make this once-in-a-lifetime opportunity possible! Xin chao, class of 2010! My name is Jamie Fehrnstrom, and I am a Princeton in Asia Fellow in Viet Nam. I left for Princeton University from the hills of Berkeley, California in the fall of 2012. At Princeton, I studied international relations and public policy in the Woodrow Wilson School and ran varsity track and field and cross country. I wrote my senior thesis on how foreign aid affects income inequality in developing countries (finding that aid is beneficial when recipients are stable and transparent but detrimental when recipients are unstable and corrupt). My junior year, I studied abroad in South Africa. All of the study abroad clichés apply. I wanted more. Fast-forward to this moment when I am sitting at the kitchen table in Can Tho, Viet Nam in between classes. I teach English to students from every grade at Trường Đại học Cần Thơ (Can Tho University). I love my students, I love this city and I love Princeton in Asia for nurturing this beautiful post and blessing me with the opportunity to inhabit it for one year. Thank you so much, class of 2010, for donating to Princeton in Asia to make my experience and experiences like mine possible. I am incredibly grateful for your generosity, and hope to meet some of you in the future to give my thanks in person! My name is Steph Kim, and I'm a second year fellow working at the Lao Rugby Federation in Vientiane, Laos. I graduated with the Princeton Class of 2015 and majored in the Woodrow Wilson School. At Princeton, I spent most of my time with the women's rugby team, Korean Asian Student Association, and Cap & Gown. After spending a summer with a Bangkok public health NGO through PiA and focusing my thesis on the Southeast Asian region, I chose to apply to a yearlong fellowship and turned my attention to Laos after hearing that the organizations had more of a grassroots approach. When Maggie told me that a fellowship with the Lao Rugby Federation opened up, I quickly took the chance to be with an organization that primarily worked in Sport for Development. I've been acting as Sponsorships and Communications Officer in which I maintain communications with sponsors, seek new sources of funding, and manage our social media channels. Additionally, I help out with whatever is needed at the time, including a recent stint as MC for the 2nd Annual Pass It Back Coach Training in Vientiane, Laos and Hoa Binh, Vietnam. This fellowship has no doubt become one of the most valuable experiences for me professionally and personally. To the Class of 2010, thank you so much for supporting PiA and giving me the opportunity to continue working at the Lao Rugby Federation for a second year! Founded in 2011, the Luang Prabang Film Festival (LPFF) is a charitable cultural organization committed to the celebration of Southeast Asian film and to the growth and support of local and regional film industries and filmmakers. The annual festival, which takes place in early December, is only one of the LPFF’s programs; it also conducts educational activities for filmmakers, organizes public viewings of films, and provides grants to local artists to help make their film projects possible. The LPFF is produced on behalf of, and with extensive support from, the Lao Government. PiA fellows will work with LPFF’s small team and the Ministry of Information, Culture and Tourism to support development, outreach and programming for the Festival and its associated educational and cultural programs. The fellowship provides a unique opportunity to contribute to economic and cultural development in the stunning environment of Luang Prabang, a UNESCO world heritage site, to help re-invigorate and rebuild a vibrant film culture that was quashed during the 1975 revolution, and to be immersed in Lao language and culture. 2016 is the inaugural year of PiA’s partnership with the LPFF, and PiA is making a targeted, intensive investment in the partnership in its first year to promote the long-term sustainability of the post. Founded in 2001, the Lao Rugby Federation is the governing body for all rugby union activities within the Lao PDR. Activities are focused on developing the sport through a school and community program, supporting domestic and elite teams to improve and developing a sound structure to provide transparent and accountable financial and administrative support to the sport. The LRF embraces the personal and community development opportunities sport can provide and is an implementing partner for Pass It Back, an innovative sport for development program which uses rugby to teach life skills and healthy living messages, with a focus on leadership, gender and financial literacy, to children and youth across Asia. PiA has been sending fellows to support Lao Rugby since 2009, and provides stipend support each year due to the Federation’s limited resources. PiA fellows are fully immersed in the rugby community, learn Lao language on the fly, and are involved with every aspect of the Federation’s work, from preparing and conducting training sessions for youth rugby players, to coaching a club team, to supporting communications and sponsorship work so the LRF can offer more community-based programming for vulnerable and underserved youth who would not otherwise have the opportunity to participate in sport. It is one of PiA’s most impactful, immersive and challenging posts.